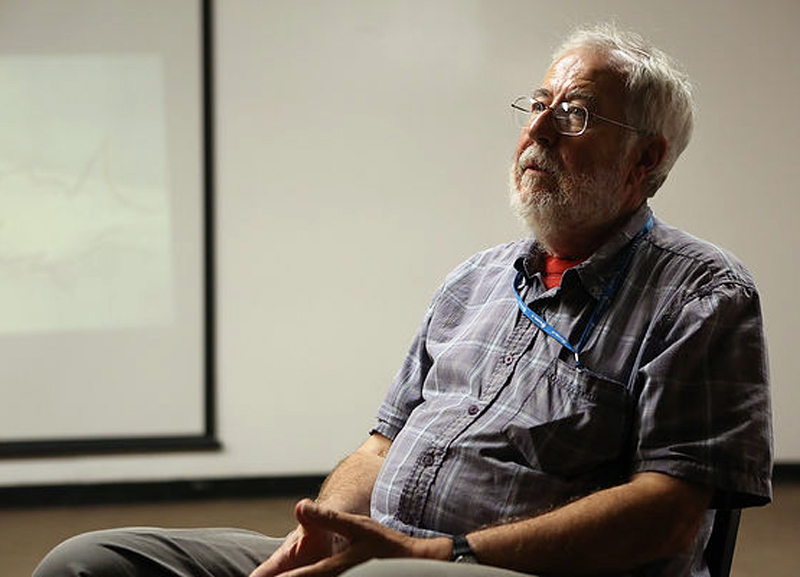 Legendary graphic designer and CalArts faculty member Ed Fella presented his final lecture before he retires in May to a standing-room-only crowd of current and former students, faculty and friends on Monday (April 15). Fella has influenced thousands of graphic designers around the world, including the hundreds of CalArts graphic design students who benefitted from his instruction, critiques and guidance and are now making their marks in the profession. 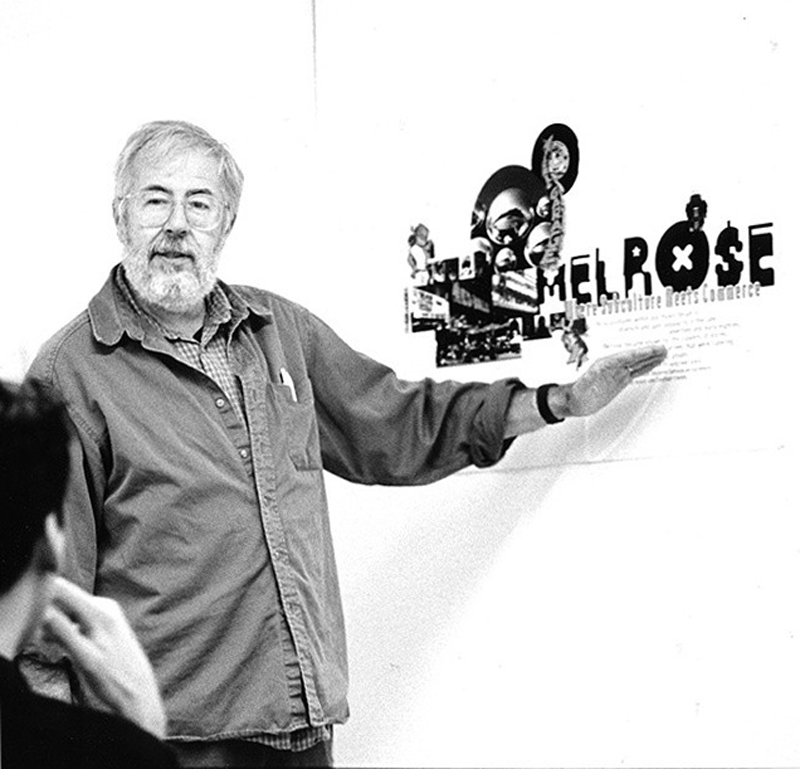 About 100 Fella fans were treated to a lesson in graphic design history covering Fella's career from the 1950s through the early 1980s, when he was a commercial designer in Detroit, to the past 25 years, after he moved to CalArts and helped lead the charge in postmodern graphic design. In his typical idiosyncratic style, Fella presented most of his lecture using the largely discarded technology of projected slides. 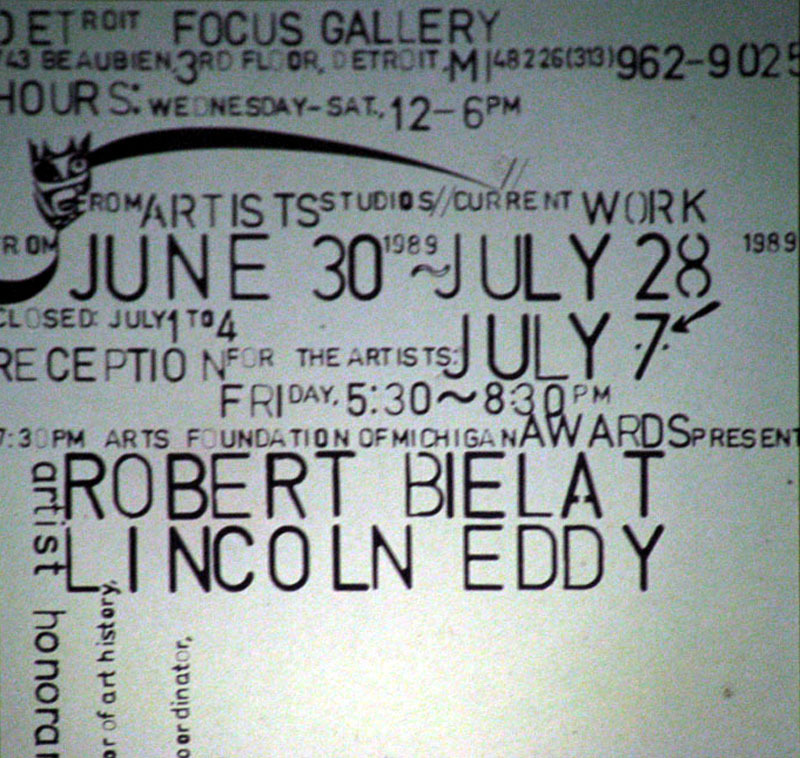 And rather than offer a chronological history, he energetically leaped back and forth over the past 55 years, as he presented examples of his celebrated work, from creative designs for Detroit manufacturers to the postmodern style of the late 1970s to his later flyers and posters for art events that were often wildly inventive in their use of hand-drawn typography featuring a complexity that prefigured today's design. 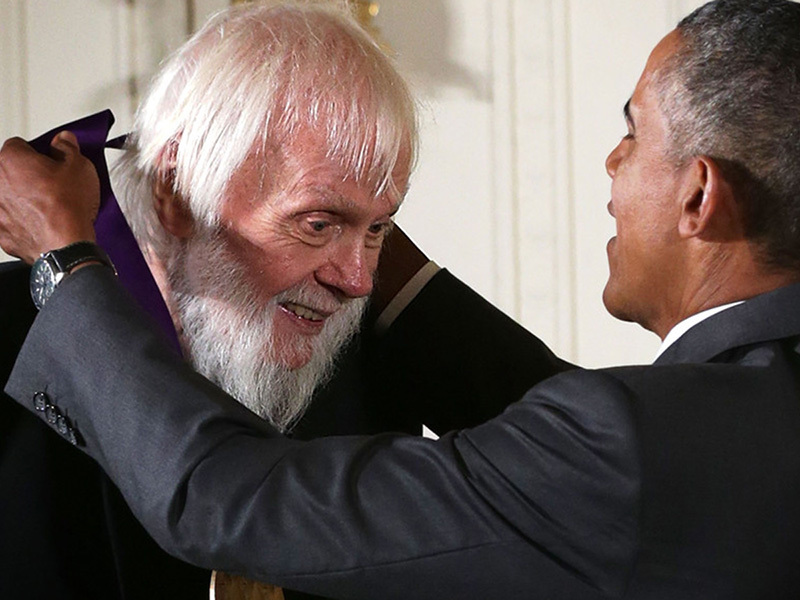 When Fella received the American Institute of Graphic Arts Medal in 2007, the citation noted that there were two acts to Fella's career — the commercial design half and the academic and experimental design part, with the latter taking over full time when he entered the MFA program at Cranbrook Academy of Art in 1985. "Back then, I realized that with client work, I couldn't express my own opinions about the world," he said. "I had to figure out how I could make personal statements outside the system." One of the primary methods he used to make a statement was radical lettering — cutting up type, twisting the shapes of letters, using unconventional spacing, and other techniques that some critics considered ugly, while others found liberating. 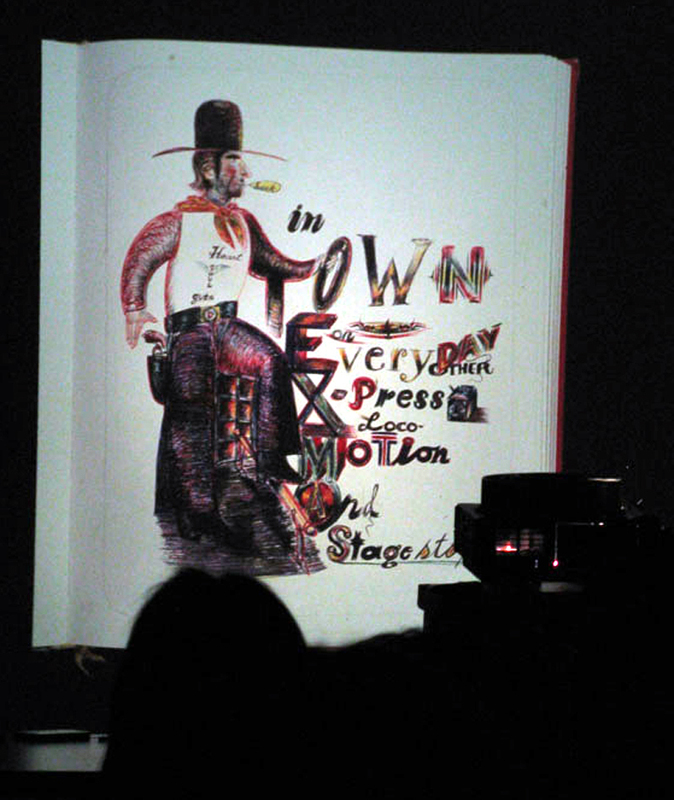 Much of Ed Fella's work plays with designs and fonts. Click to enlarge. In 1987, after he joined the CalArts faculty, he began collecting and using vernacular typography or lettering — often handmade — that could be found in neighborhood retail shops or on signs along roads. Each summer, he would take cross-country driving trips, taking hundreds of Polaroids of quirky local signs. "I began thinking, ‘Why not just use vernacular irregularity in a masterful way?'" He also filled sketchbooks, which now number about 120, with spontaneous ideas that often humorously critiqued traditional graphic design. After running through three carousels of slides showing all facets of his work, Fella was asked whether CalArts had influenced him. "Of course. Can you imagine being in graduate school forever?" Fella said, comparing his life at CalArts to the movie Groundhog Day, in which the character played by Bill Murray relives the same day over and over, often with different results. But in Fella's version of the movie, he said, "Every day has been a perfect day." Asked if he had any final advice for his students, Fella said, "Be your number one fan. Have confidence in yourself, work hard, be curious about everything, and it will all work out."